Pixie Turner is the founder of Plantbased Pixie, a food blog and Instagram sensation with over 120,000 followers. Pixie Turner is a qualified nutritionist (MSc) and scientist (BSc). She graduated with a First Class degree in Biochemistry in 2014 and went on to complete a Masters in Nutrition with Distinction in 2016. Pixie is dedicated to promoting a no-BS healthy lifestyle supported by evidence-based science. Thanks to her outspoken and (at times) controversial views in the wellness industry she describes herself as a ‘wellness rebel’. As well as organising food events in London, she has also been featured in various publications as both a nutritional expert and recipe developer. Many leading businesses pay for their employees to have flu jabs, private healthcare, exercise classes and cultural activities on the basis that the physical and mental health of their workforce is a valuable asset. Pixie argues that every member of staff should have practical training about nutrition based on scientific fact, to help them cut through the noise and damaging myths circulating online, on the high street, and in popular cookbooks. She debunks nutrition myths and advocates for a balanced lifestyle without restriction. Food should make you both happy and healthy, otherwise what's the point! 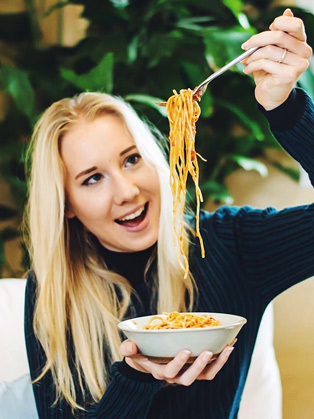 Her food journey has taken Pixie from stereotypical university student (think frozen ready meals), to cutting out every food group she could think of in the pursuit of “health” (no meat, fish, eggs, dairy, soy, gluten, refined sugar, or joy), to now having a much more balanced and happy approach to food and health. Pixie is a scientist and a sceptic, so does not believe in detoxes, fad diets, or that food can cure everything. That’s just not how the human body works. She eats a plant-based diet, using the scientific definition of plant-based meaning ‘a diet based on plants’, not necessarily a diet solely consisting of plants. She has a passion for helping people to improve their scientific literacy and be more sceptical about the advice circulating online (spoiler alert: 90% of it isn’t credible), and she intends to use it. As a nutritionist Pixie works with clients on improving their relationships with food using non-diet approaches. She is an advocate for Health At Every Size, so you won’t find any diet culture here. How has social media shaped the way we eat? Are we addicted to food?